George W. Robertson, "the steam roller" also "Sir Herky." Former Umpire P. H. Roy said, "Robertson was a 17 st giant who followed the ball all day." "George Robertson, a player blessed with all the magnificent physical development, remarkable activity for a burly man, and limitless staying power". 1872 "Whose burly form of strength and activity are a valuable support to the light forwards of the team". "Remove the dead and let the play proceed". Players and spectators were convulsed with laughter. 1875 G. Robertson named in The Argus as playing in a Carlton First Twenty side against a Carlton 25 team in a scratch match at Royal Park on Saturday 8th. May. 1875 Robust and strong, he turns his weight to good advantage, a good kick. 1876 Kicks, dodges, marks well. 1877 Very much improved, plucky cool, and hard to knock over, very active in the ruck, and effective in general play; a splendid drop kick. 1878 Has advanced to the first rank of players, excels as a follower where his weight, stamina, and quickness to utilise the opportunity has combined to make him invaluable. G. Robertson played in both the Carlton-Waratah (Rugby) and the (Australian Football) exhibition games at the M.C.G. 30 June, and 1 July 1878. 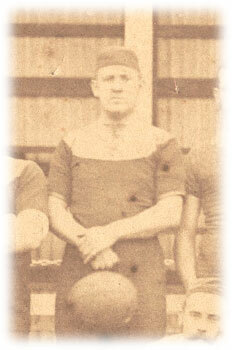 G. Robertson scored 1 goal during the 1878 season. 1879 Vice Captain; A really wonderful fine tempered player - considering his weight. As active as a "sprite", and stands not on the order of kicking, but kicks at once. Has great endurance, and is a follower "par excellence". George was in Sydney and was named to play for the Waratah club against the Wallaroos at Moore Park. This probably was a rugby game as the Sydney Daily Telegraph (p6) has 15 and 16 men named respectively. Monday's report said that "owing to certain objections", George was not allowed to play. 1881 Captain and another to shine during the 1881 season, " imbibed with a spirit that should actuate all true players, the general weal not self ". 1881 Robertson, G. W. (Captain) - Imbued with a spirit that should actuate all true players, the general weal, not self; as captain in expecting his team at all times to be imbued with a kindred feeling, has possibly erred, but this was no justification for "croakers" to rail against the effort of his determined, skilful and manly play when not rewarded with succes; after all nothing succeeds like success. George Robertson umpired the Hotham - Geelong match at the East Melbourne Cricket Ground. The Sportsman newspaper, June 14, mentions that there may be a match between the South Yarra and Northcote clubs played on the M.C.G. If it goes ahead, the umpire will be Carlton's George Robertson. George Roberston played for the Blues in an ex players match against former Pivotonians at Geelong to raise money for the local hospital. At the Carlton AGM, G. Robertson was elected as co Vice President of the club. "Old Boy" of The Argus wrote about the best footballers to have played and mentions George Robertson among the Carlton champions of the early 1880's. The Argus (page 9) has a photo of a group of former players meeting with the Lord Mayor of Melbourne to arrange an old players match in aid of the Lord Mayor's Hospital Fund. Amongst this group are two former Carlton players, George Bell and G. Robertson. The Sporting Globe January 03 writes about George at the Test Match at the MCG. "King George (then a midshipman) was an interested spectator. After the match he sent for Robertson, and the young Prince complimented the Carlton skipper on the manner in which he handled his team." 1929 - Three Carlton captains - a vice president, a long serving hon-sec of the VFA, and a president. Both Robertson and Gardiner would have been in approx 79, and Marshall 89 years of age. "Old Boy" writing in The Argus August 12 (p12) about past players quotes The Footballer's write up about George. George Robertson (Carlton) - "A really wonderful fine tempered player - considering his weight. As active as a sprite and stands not on the order of kicking, but kicks at once. Has great endurance, and is a follower par excellence." "A man that made a name for himself as an umpire in the early days was George Robertson, the old Carltonian. When his playing days were over such was his love for the pastime that he became an amateur adjudicator, and though an old Carlton player was paid the compliment by Melbourne and other clubs of being always asked for his services in their games against Carlton. He was the first man to throw the ball in from out of bounds when facing the players. He is a hardy annual, is the old Carltonian, a rare lover of clean sport, one who regards knocks and danger as the salt of life. On one memorable occasion when he was in charge, a player received such a terrible spill from a shoulder thrust that he lay prone, unable to move, and play kept in the vicinity of the stricken player for some considerable time, the contestants frequently jumping over prostrate form in an endeavour to get the ball. At last he got on the nerves of one of the players, who excitedly rushing up to the umpire, exclaimed, "Umpire, umpire, stop the game, the man is dead." George Robertson looked sternly at what he regarded as a degenerate for a moment or two, and then, waving his arms towards the pavilion, sang out in stentorian tones, "Remove the dead; let the game proceed," an order that was obeyed literally. As it turned out the man was not dead, but only unconscious, but, as the veteran said, "Fancy being asked to stop a grand game just because a man was killed." He was so annoyed and disgusted that he struck the interjector off his list of acquaintances." George Robertson died as a result of a fire which broke out at his Parkville boarding house on Friday night. He was severely burned and taken to the Epworth Hospital where he died. Robertson was Carlton captain in 1880 and 1881. He was also president of the Carlton Cricket Club for many years. His brothers, Colonel Robert Robertson & Val. Robertson also played with Carlton. George Robertson used to umpire matches. The Leader newspaper May 09 1914 said that one of his catch phrases when umpiring and players were injured, was, "Carry off the dead." THE COUNT, THE COLONEL, AND THE BOOZER. A descendant of the Robertson brothers contacted the club with a photo of the Robertson family. Carlton historian Tony De Bolfo put together this story. Contributors to this page: blueycarlton , pblue , Jarusa and molsey . Page last modified on Saturday 15 of July, 2017 12:36:00 AEST by blueycarlton. 2003 - Hanna & Williams.